A week ago, I took a great friend out for her birthday. We now have a weekly ritual that we will meet at restaurant after work on Fridays. Oak Park, Illinois, has been our middle ground and she had suggested that we meet at a Greek restaurant that had she had visited already. We met after work, but there was an Indian restaurant that was across the street from the Indian restaurant that she had not sampled. Neither had I. So we ended up there sating ourselves and making plans to return to the Greek restaurant soon. With it being her birthday and food was involved, there was no argument. 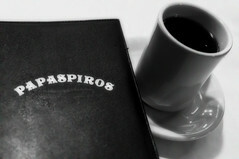 Papaspiros at 733 Lake Street in Oak Park, Illinois, is very much an authentic Greek restaurant outside of the Greek restaurants immediately west of downtown Chicago. All who are working the floor and the kitchen are Greek. It simply is not that they all spoke Greek to each other and shouted, “Oopaaa!! !” when setting the saganaki on fire. If you have ever gone to a genuine Greek restaurant, you know the interaction and the flavouring of the food tell it all. 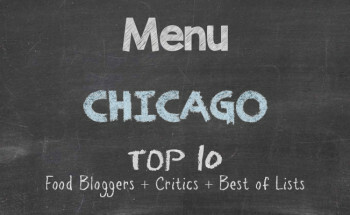 For example, when we asked for recommendations, our server lit up like Paris at night. She spoke of Greek dishes where the meat falls off of the bones, pop with flavour, and are tender enough to cut with plastic forks. Wow! And considering the restaurant was filled, there was no rushing us to place our orders or attitude when we handed the menus back and said that we would accept her recommendations only, whatever they would be. Ready for the full experience in a family style manner, we ordered a saganaki for starters, my friend having a cosmopolitan aperitif and me having a spicy Greek red wine. Now I will say this: I have not been to a Greek restaurant that did not put on a presentation when bringing a saganaki to the table. Grilled cheese on a skillet that is lit on fire at your table and then doused with lemon juice while the server is shouting “Oopaaa!! !” is an experience all by itself. Talk about starting the night off on a good note. Carrying on conversation a bit too long, one other server came by and cut our saganaki for us and told us that is better to eat it soon after the fire is put out because it loses it flavour as it reaches room temperature. This is service you receive at American [sports] bars and grills. The first entrée we indulged was arni kokkinist. 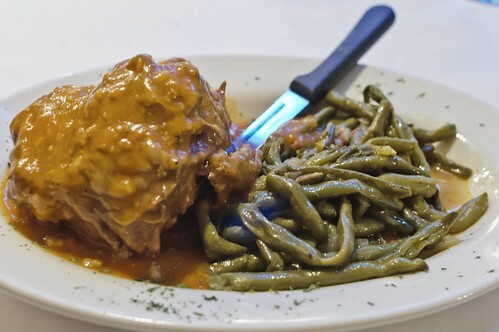 What sat before us was tender braised lamb, flavoured with fresh herbs, spices, and white wine, and served with green beans in light tomato sauce. I could have taken my wine glass and thrown it into a fireplace to show my approval. Then again, that may be rude, plain and simple. Instead, I just started humming. Being a pescatarian, eating lamb was a stretch, but it was the second part of my friend’s birthday celebration and I was not going to act a fool as far as food was concerned. The server came to the table and asked us what we thought and my friend said she would give a 9 out of 10. Why did she say that? The server looked very dour after that and it was then very apparent that there is great pride in the food that comes from the kitchen. We quickly changed the response to a perfect ten. With lamb meat falling off the bone as the server had told us and exploding with great taste along with fantastically seasoned green beans, the arni kokkinist deserved more than just a ten. For the second round, we had sea bass with rice pilaf and steamed mixed vegetables of potatoes, carrots, zucchini, and cabbage. 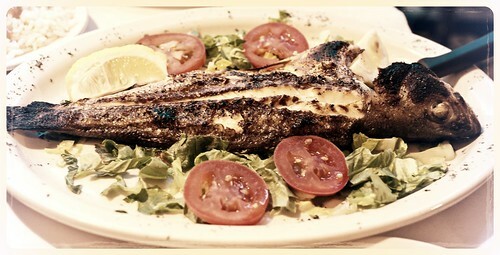 We had the option of having the fish prepared fillet for us, but we instead ordered it as they would have it in Greece — complete with bones and with the head intact. Again, here was a dish so mighty with zest that my friend and I took our times savouring each bite. Well, I should put that in context. We took our times so that we were not gobbling the small bones in the fish. There was so much meat on the sea bass that I made a mental note to look for sea bass the next time I go to the fish market. The rice pilaf and the mixed vegetables were perfect accompaniments and our server seemed to smile wider every time she passed by and saw us nodding our heads in appreciation for the offerings that she had suggested. Yes, she had done her job to a point past our satisfaction. After sitting for some time to chat about work related tomfoolery, we were ready for our third entrée. 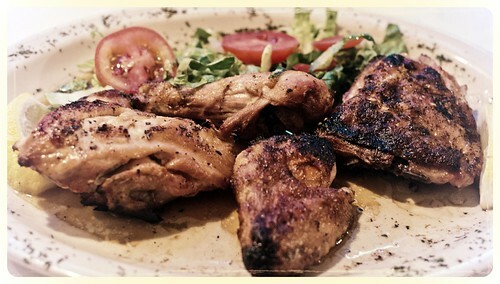 We ordered more wine and per high marks from our server, we had Grecian riganati chicken. Oven roasted chicken marinated with olive oil, lemon sauce, and oregano, and served with rice pilaf was a perfect wrap-up entrée. We had been told that it would take half an hour for the preparation and it came to the table in perfect timing. Thankful that each bite was succulent as our teeth worked on the moist meat until we could not finish the two remaining pieces, it was a unanimous vote that Papaspiros was an outstanding restaurant for part two of my great friend’s birthday dinner and the continuation of mine from earlier in the month. Our server was rather impressed with our feasting talents, as she thought we had finished everything set before us except for one chicken breast. Haha. We told her that we saved two pieces because we wanted some room for dessert. We should have stopped, but what is a splendid meal without a proper dessert? 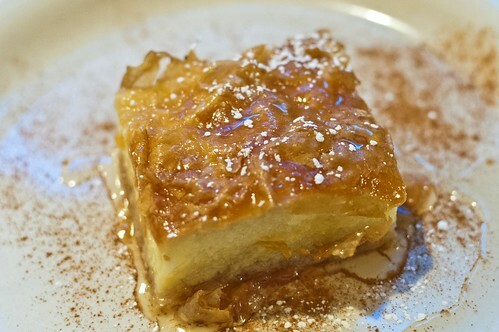 My great friend and I had coffee and galaktoboureko. Semolina-based custard flavoured with lemon in phyllo, drizzled, and sprinkled with cinnamon with honey was enough to shoot us to the moon. It was perfect with the coffee, that being it was not too sweet and the coffee was not bitter Americano. I think the patrons who were sitting next to us wanted us to stop humming, for we were exhibiting way too much bliss. Let’s face it. If you have some awesome food sitting before you and you are enjoying it, there is nothing wrong with letting it be known that you have gratitude for knowing that you are delighting yourself with something worthy. If our experience at Papaspiros was any indication of the validity of the saying, “Anything worth having is worth waiting for,” then we understand that old adage. The corner where Papaspiros is located boasts a compendium of ethnic restaurants — Mexican, Indian, Greek, American, Italian, and a few others that I have yet to visit. But if you are indeed on a quest for an authentic Greek restaurant with top service and outstanding food, Papaspiros is one that I would say to add to your list. Any time I waddle from a restaurant, they have done good. Such was the case with this Greek wonder. Oopaaa!!! !